This entry was posted on May 13, 2013 and tagged bike path, development, Housing, McKinley Village, Sacramento, smart growth, sustainable, urban infill. Bookmark the permalink. An awkward swath of land in east Sacramento, walled in by a freeway and an elevated rail line, has defeated developers’ dreams for a quarter century. Failed plans include a “European style” high-rise village, an auto mall and big-box stores – all opposed by neighbors. Today, Phil Angelides, former California state treasurer and a veteran developer, thinks he has the key to the 48 acres along the Capital City Freeway: single-family homes. His firm is pursuing a modified version of a plan it put forward in 2008 to build hundreds of houses and punch a street and a bike path under the Union Pacific train tracks. 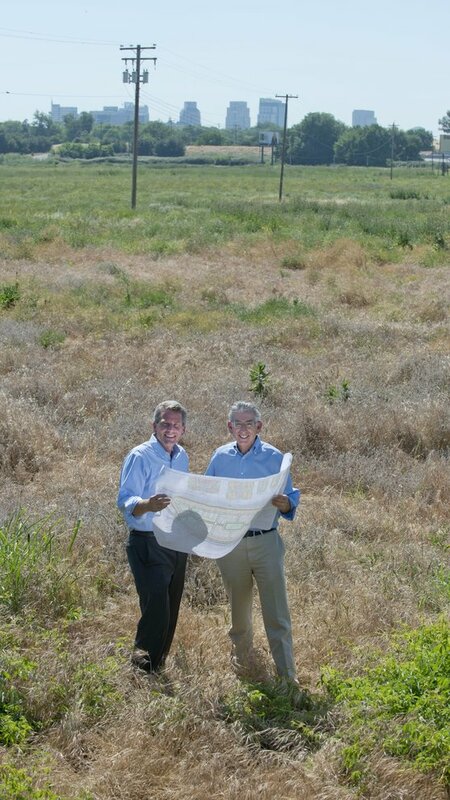 Builder Kevin Carson, left, of the New Home Co., and developer Phil Angelides look at plans for McKinley Village, a single-family housing project proposed for an east Sacramento site where development plans have repeatedly failed to pan out. Angelides calls the planned development McKinley Village, after the elegant McKinley Park neighborhood blocks away. His proposal went dormant during the housing crash, but with area home prices surging and the number of houses for sale near record lows, the one-time candidate for governor said he has “dusted off” the $130 million project and is determined to see it through. “We’re moving forward, full steam ahead,” Angelides said. He aims to start selling homes by the spring of 2015. Angelides joins other developers advancing difficult and ambitious urban housing projects, some near the city’s most desirable neighborhoods, that were put on hold during the crash but suddenly have momentum now that the market is reviving. “It’s just an indication that people are eager to tap that market,” said Mike McKeever, head of the Sacramento Area Council of Governments, the region’s transportation planning agency and an advocate for urban housing and containing growth on the suburban fringe. During the height of the housing boom last decade, McKeever said, 45,000 housing units were “under construction or in the serious dreaming stage” on “infill” sites in Sacramento and West Sacramento, including high-rise condominium towers downtown. While it’s unlikely such a huge number of units will actually ever get built, McKeever said, the region’s slowly improving economy will revive many projects. “I think if we continue to have an economy there’s going to be a lot of this,” he said. Developers pursuing these sizable urban housing projects are responding to perceived demand from buyers who want to be closer to jobs and urban amenities and are willing to pay premium prices for modern homes near the city’s older leafy enclaves. “People want a higher quality of life, and they don’t want to be in the car as much,” said developer Paul Petrovich. One of the first big urban projects to take shape will be Petrovich’s Curtis Park Village, 268 homes on a former railyard sandwiched between Sacramento City College and the Curtis Park neighborhood. After spending $30 million cleaning up toxics at the site, and years wrangling with residents, Petrovich said he expects construction to start next month. Petrovich recently opted to cut the amount of retail space planned for Curtis Park Village and add more houses. The neighborhood had long sought such a change, and Petrovich had resisted. The reason he finally made the switch: market demand. Another project in the works is Northwest Land Park, where 825 smaller, energy-efficient homes are planned for an industrial site along Interstate 5 that connects to a corner of the upscale Land Park area. The developer, Ranch Capital of San Diego, hopes the green cachet of the homes and sleek design touches, such as recycled-glass countertops, will appeal to empty-nest baby boomers and young urban professionals. Both groups are expected to make up a large portion of future home buyers, said spokesman Kevin Smith. Building for the first phase could start next year, Smith said. The proposal for the 32- acre project on the site of the Setzer wood processing plant has been in the works since early 2010. Proposals for the McKinley Village site go back about 25 years, to the late 1980s, when high-tech executive James Lennane began formulating his plan to transform the slice of urban acreage into a high-rise office, apartment and hotel project. The name of the failed plan stuck; people still call the property Centrage. A local farmer, Clayton Mize, used to grow peaches on the land, selling them near the entrance to the old city landfill, but the trees were chopped down years ago by developers. Today, a giant image of country singer Dwight Yoakam keeps watch over the property from a billboard along the busy freeway. Amtrak’s Capitol Corridor trains roar along the embankment 20 feet above a wide crescent of scrubby grass. The property is owned by a partnership controlled by developer Angelo K. Tsakopoulos, who developed large portions of suburban Sacramento, including much of Elk Grove, Natomas, Folsom and Roseville. Tsakopoulos for decades has been a political backer and patron of Angelides, who formerly ran Tsakopoulos’ AKT Development. Angelides and Tsakopoulos were partners in creating Elk Grove’s Laguna West neighborhood, which drew attention for its attempt to incorporate urban-style features – such as street trees and nearby stores – into a suburban environment. Now Angelides, who lives in Land Park, has an option to buy the former Centrage property from Tsakopoulos. He envisions a grid of tree-lined streets, jogging paths and parks, along with 328 homes built in neo-traditional styles: craftsman, Mediterranean and Tudor. The plan, submitted to the city in April, is intended to be “in harmony” with the quiet, leafy streets of neighboring east Sacramento, Angelides said. A wall and trees would shield residents from the freeway noise. “This neighborhood will be very akin to McKinley Park,” he said. To accomplish his goals, Angelides is partnering with the New Home Co., a builder known for the quality of its mid-sized projects. The company’s Trails development in Folsom, with 71 homes clustered around a park next to a shopping center and bike path, has been among the best-selling projects in the region the past two years. That vision of a walkable, livable community “is exactly what we’re looking for,” Angelides said. New Home President Kevin Carson said he expects the houses at McKinley Village to sell from $300,000-plus for a 1,250-square-foot cottage up to about $700,000 for a 2,500-square-foot family home. At Curtis Park Village, builder Mike Paris said he will probably charge around $490,000 for cottages that start at 1,550 square feet. Those premium prices reflect the desirability of the homes, with plenty of bathrooms, closet space and other modern amenities in houses that are close to downtown and part of established, walkable neighborhoods. “It’s the characteristics of what people want to buy,” Carson said. Angelides noted that even during the housing collapse, older, close-in neighborhoods such as Land Park, Curtis Park, midtown and east Sacramento held their value far better than new suburban housing tracts. There’s a reason, though, why developers tend to gravitate toward building subdivisions on open farm fields. Urban properties are notoriously difficult and expensive to develop, in no small part because of neighborhood opposition. In the case of McKinley Village, for instance, it remains to be seen whether east Sacramento residents will embrace the plan or fight it. Powerful opposition helped kill Lennane’s Centrage project and other proposals that were out of character with the surrounding neighborhood. Some residents say Angelides’ plan is much better, but they still worry about traffic, flooding and design quality. Paul Noble, president of the East Sacramento Improvement Association, said he and others are eager to see a traffic study that could be coming out in about a month. The plan calls for two exits that would funnel cars into surrounding residential streets. The impact, and any mitigation that needs to happen, are among the top concerns. Neighborhood groups will hold a meeting June 4 at the Clunie Community Center in McKinley Park to address these issues and others. “I think it’s the best we’ve seen so far,” Noble said of Angelides’ plan. Ellen Cochrane, president of East Sacramento Preservation, a neighborhood group, said the group is concerned that Angelides proposes to punch holes in the railroad embankment, which she said functions as a secondary levee protecting east Sacramento from flooding. “We’re holding approval in check,” she said. Angelides has responded to neighborhood concerns about flooding by promising to install floodgates in the embankment openings. But he said he knows he won’t win everybody over. © Copyright The Sacramento Bee. All rights reserved.